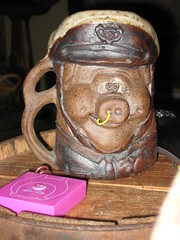 I thought I would share with you a small funny – do you remember this policeman pig mug from my Pig a Day series? Well, he sits next to my knitting chair and holds all kinds of crafty things, Chibis, stitch markers, crochet hooks, scissors etc. Do you see what D#2 did to him? She took a stitch marker and gave him a nose ring! Now he looks like one of the Village People! She’s a wiseguy that one. I must admit, I find it very funny and also somehow oddly fitting – he seems happier, more at peace with himself. and how about a big WOW for all of those birthday wishes!!!! you guys are the best! I had a great day – Boar has informed me that the shipment on my present was delayed, so I will have to regale you with prezzies pictures at a later date. I have been explaining to everyone my theory on becoming 45. When you turn 40, you know that you have hit a number. That somehow a shift has occurred. However, you are so newly arrived in this position, this age, that is almost seems like pretending. For example, a kindergartener or first grader is technically in the school system, but they are so young, so cute that it hardly seems serious. Sure they have homework and they are learning – but it’s all so darling that it just makes you smile. Forty five is a different story all together. Now people sigh, nod their heads knowingly and say, “45?! you might as well be 50.” It’s all about the rounding up. That piggy does look happier. I just turned 50 – it’s the new 35. Sooooo – you’re really only 30! Live it up. Oh, now I’m all confused about how I should feel about 49… is it the new 29? Or am I standing at the top of the long, downhill slide? Can’t wait to see prezzies! And I love, love, LOVE the nose-ring. And now I have YMCA stuck in my head, too! Having been down this fast road, I will say that 45 is the gateway to 50. That being said, I’ll be 55 this summer…yikes! I’m 48 going on 12. I for one, plan to go down kicking and screaming. Oh, and if your kids think it’s cool to adorn your pig in a cop’s uniform mug with a nose ring, then you are, in fact, cool chickie. Oh NO! 45 is 45 no more, maybe less!!! and I agree with Carol, as long as the ring nose makes both you and Mr. Police Piggie happy, both of you are young in my book! I. beg. your. PARDON? No. No. No. No. Absolutely NO rounding up. I’m gonna be 49 this year, and NO. ROUNDING.UP. Hope you had a great Birthday…Screw the number…you look MAHvelous DAHling!!! But about rounding up? Um, well I’m in my 50s, so no, no rounding up for me yet.